Blurb Description: From Annie Barrows, the acclaimed #1 New York Times–bestselling coauthor of The Guernsey Literary and Potato Peel Pie Society and the author of the award-winning and bestselling Ivy + Bean books, this teen debut tells the story of Charlotte and Frankie, two high school students and best friends who don’thave magical powers, fight aliens, crash their cars, get pierced, or discover they are royal. They just go to school. And live at home. With their parents. A great read for fans of Becky Albertalli, Louise Rennison, and Adi Alsaid. Nothing ever happens to Charlotte and Frankie. Their lives are nothing like the lives of the girls they read about in their YA novels. They don’t have flowing red hair, and hot romantic encounters never happen—let alone meeting a true soul mate. They just go to high school and live at home with their parents, who are pretty normal, all things considered. But when Charlotte decides to write down everything that happens during their sophomore year—to prove that nothing happens and there is no plot or character development in real life—she’s surprised to find that being fifteen isn’t as boring as she thought. It’s weird, heartbreaking, silly, and complicated. And maybe, just perfect. Before I begin talking about this book, do me a favour and close your eyes. Imagine that you’re texting your best friend in a hurry, with disjointed sentences and things that only make sense 50% of the time. Can you see it? All the ‘likes’ and the ‘OMGs’ and the analogies that make almost no sense because you’re freaking out about something. Have you ever told your best friend that if anyone read your texts, that you’d be committed into a mental institution as well as them because the trauma was irreparable? WELL, THAT’S WHAT READING THIS BOOK WAS LIKE. I feel like I was THROWN into a TWO HUNDRED PAGE TEXTING THING BETWEEN TWO BEST FRIENDS and I feel TRAUMATIZED as I come out on the other side. Honestly, I WAS SO ANNOYED WITH THE WAY THIS ENTIRE BOOK WAS WRITTEN. It was disjointed, horrid and made me feel like someone with obscenely long nails was scratching their way up a blackboard. 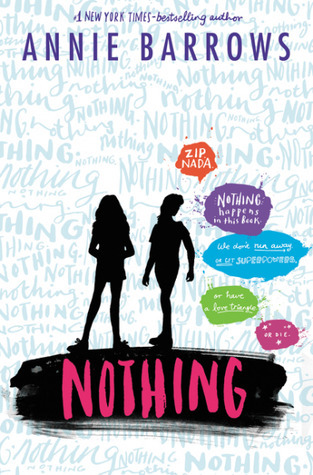 Nothing is told in alternate points of view between Charlotte and Frankie, two fifteen year old best friends with who get like ‘two hundred texts a day’ but ‘nothing’ ever happens to them and ALL THE COMPLAINTS ABOUT THEIR LIVES. Despite the fact that I read this book in less than a day, I kept thinking about how I WOULDN’T BE READING this book if it wasn’t a review copy. I just feel like despite I LOVE the Young Adult Genre, there are books like Nothing that I’ve outgrown and honestly, shouldn’t be reading. I didn’t enjoy this book at all, and I’m going to go and read something I know I’ll love right now! 2 stars. Annie grew up in Northern California, and graduated from the University of California at Berkeley, with a degree in Medieval History. 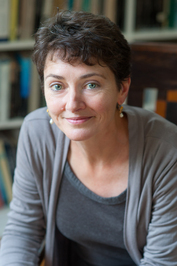 Unable to find a job in the middle ages, she decided upon a career as an editor, eventually landing at Chronicle Books in San Francisco, where she was in charge of "all the books that nobody in their right mind would publish." After earning an M.F.A. in Creative Writing at Mills College, Annie wrote (as Ann Fiery) a number of books for grown-ups about such diverse subjects as fortune-telling (she can read palms! ), urban legends (there are no alligators in the sewer! ), and opera (she knows what they're singing about!). In 2003, Annie grew weary of grown-ups, and began to write for kids, which she found to be way more fun. Have you read Nothing? What did you think of it? What was the last book you read that you simply COULDN'T STAND? How are your 2017 Reading Goals going?